Red Deer Advocate, May 24th, 2008. Michael J. Fox has done some comedic acting that we have no issue with. Back to the Future seems to have been a harmless enough act. Unfortunately, some of this man’s other achievements are not so praiseworthy. On one sitcom he glorified greed; on another he exalted indecency. Should an educational institution not reserve its honors for persons who teach good morals? Michael J. Fox’s sitcom sins are intimately connected with one that we tend to overlook. When sins like greed and indecency are acted out with humor, and then go unchecked by a corrective context, they tend to be approved of by the audience. That’s what gets accomplished by sitcoms like Family Ties and Spin City. Teaching bad morals in this way is a form of treachery, deceit, guile. The audience is not just entertained; it is beguiled. Guile can be so much a part of a sinner’s routine that it begins to look like a sinful disposition. For years, Michael J. Fox took his medication in punctilio fashion in order to hide his disease. Only when the disease could no longer be concealed did he go public as an advocate for it. Standing before Congress, then, again looking out for number one, he presented the case for Parkinson’s. But for this act, he ‘forgot’ to take his medicine. So first, being ashamed of his disease, he tricked his fans into thinking he was healthy. Then, when he could no longer hide the stigmatizing condition, he shamelessly made himself appear sicker than he could have looked in order to charm pennies from the public purse. How beguiling. Not surprisingly, guile (being trickery for the sake of self) would go so far as to wound others for its own welfare. Mr. Fox not only campaigns for money, but for embryonic stem cell research too. Embryos are persons in the bud. Should healthy persons be destroyed to fix persons who are sick? Are actors more valuable than cells that could become so much more? We tend to especially excuse the sins of the sick and wounded. But does sickness or injury make sinning less damnable? No. God’s Law is not so lax. No excuse for sin will be accepted by God, not even Parkinson’s. We need a Saviour, then. Both the healthy and the sick, Michael J. Fox and everyone else, ought to look unto Jesus in prayer. Ask him, whoever you are, for what the Spirit can give you so that you may receive, as Nathanael did, a commendation for lack of guile. “Jesus saw Nathanael coming to him, and saith of him, Behold an Israelite indeed, in whom is no guile!” (John 1.47.) There is an honor to be in receipt of! To be commended by Jesus must be, if anything is, a signpost toward salvation; perhaps it is even a sign that salvation is obtained already. 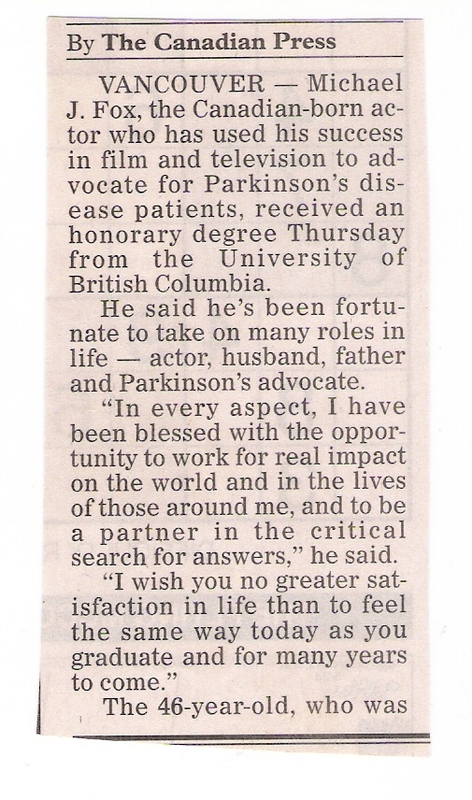 The Edmonton Sun, January 25th, 2009. 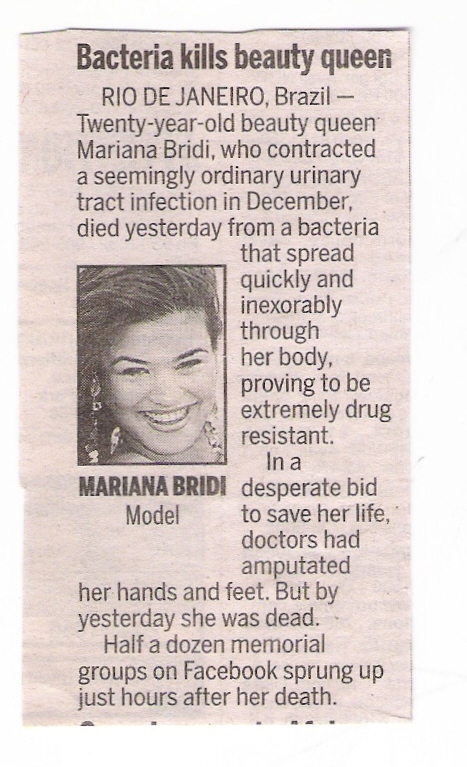 I don’t know anything more about Mariana Bridi than what the article tells me. That she was a beauty queen is obvious. Youth and beauty seem to defy corruption, maybe especially when in the form of Woman. The truth is, youth, energy, and beauty seem like a trinity of incorruptibility. And so their death strikes us like a thunderbolt and makes headline news. Let us not forget, though, that every death is tragic. 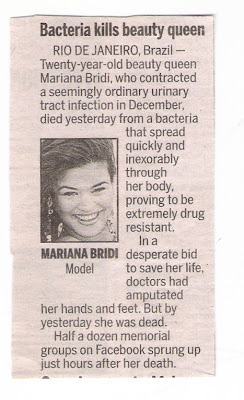 The death of Mariana Bridi is a terrible exhibit of a truth that is easily and regularly confirmed by observation: Death can happen to anybody at any moment. In his meditation on the meaning of life, King Solomon concluded that we should fear God and obey him in light of the judgment to come. This conclusion is begged by an observation he earlier made, “I returned, and saw under the sun, that the race is not to the swift, nor the battle to the strong, neither yet bread to the wise, nor yet riches to men of understanding, nor yet favour to men of skill; but time and chance happeneth to them all. For man also knoweth not his time: as the fishes that are taken in an evil net, and as the birds that are caught in the snare; so are the sons of men snared in an evil time, when it falleth suddenly upon them” (Ecclesiastes 9.11, 12.) What he means is that swiftness or strength or wisdom or whatever advantage a person may have over others, is no guarantee of an escape from surprising pitfalls. Does this beauty queen not look swift and light, sound and strong, rich and wise? but alas! also like the gentle bird that gets caught in the snare? Strength does not always win; wisdom is no security; beauty may be cut short. King Solomon was well acquainted with this principle. This was not just a proverb to him. He had had this older half-brother, Absalom, “from the sole of his foot even to the crown of his head there was no blemish in him” (2 Samuel 14.25.) He was the epitome of abundant life, just like this girl. His hair, for instance, grew so richly that for curiosity’s sake it was put upon the balance once a year to be weighed (verse 26.) Absalom was not only a beauty, but a beauty who would be king in place of his father, just as Mariana Bridi would surely have displaced many reigning beauty queens. But both were cut short by snares lurking in the paths they trod. What snares lie ahead for you? Of course, you cannot know, for the nature of a snare is that you step into it unawares, without noticing. Because of this, and for reasons innumerable, the advice of Solomon should be taken to heart. You need to look into it. What is this fear of God? this obedience? these commandments? this judgment to come? What to do? Is there no snare waiting for me? The reader up in Canada will say, ‘This is a southern bug that killed the beauty queen down in Brazil. But I’m okay.’ Yes, and the reader down in Brazil reads his or her own newspaper, and says, ‘This is a faraway avalanche that buried the ski bunny way up in the Rocky Mountains. But I’m okay.’ Shall we not say that such reasoning is pure evasion? Is it not reckless to maintain that the snare is always laid for someone else? Will you put off this warning to fear and obey God? Do you think that beauty, wisdom, or strength is a guarantee of time, life, and opportunity to do later what you know deep down you should do now? “For let us hear the conclusion of the whole matter: Fear God, and keep his commandments: for this is the whole duty of man. For God shall bring every work into judgment, with every secret thing, whether it be good, or whether it be evil” (Ecclesiastes 12.13, 14.) Fearing God is Old Testament faith. Fear God today by trusting Christ for tomorrow.